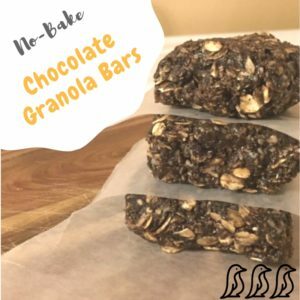 The perfect alternative to store-bought candy bars and granola bars, these healthy no- bake chocolate granola bars are easy enough for kids to make, and irresistible for kids of all ages! Consider making a large batch and freezing individual bars for grab-and-go snacks or to pack in lunches! Combine all ingredients in a large bowl and mix thoroughly with a wooden spoon (or your hands). The mixture will be slightly crumbly, but also easily molded. If the mixture seems too dry, add an additional spoonful of honey or peanut butter. Press the mixture into an 8×8 baking dish. Cover and store in the refrigerator. To serve, cut into bars and enjoy!